2 or more: $239.58 ea. 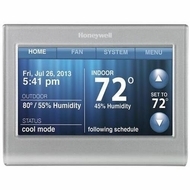 This Honeywell RTH9580WF thermostat features Wi-Fi capability, so you can manage and monitor the temperature in your home via your computer, tablet or mobile phone. The color touch screen simplifies use and can be customized to suit your preferences. Customizable Color Touchscreen - The bright, easy-to-read touchscreen can be color customized to fit your mood, match your paint, or support your favorite team!